FAQ 4 – How Come God has NOT healed me or given me a Baby yet? Question: – How Come God has NOT healed me or given me a Baby yet? Answer: When it comes to the Finished Work of the Cross and what Jesus has ALREADY purchased, this is ALREADY your inheritance! God is NOT Withholding from you! The truth is that God cannot withhold (or withdraw) what He has already freely done through His son. If you are in Christ then what Jesus purchased is already your inheritance. You received this inheritance when you first came into relationship with Him! When you first accepted Jesus free gift of Salvation did He have to go and die all over again for your sins? No! Why? Because He already provided the way for you (and for the whole world) 2000 years ago. Likewise, He does not need to shed one more drop of blood to redeem you from the consequences of sin, or take one more stripe for your healing! What Jesus did on the Cross was a complete, perfect and finished work! When we received the free gift of Salvation we entered into a position of rest, which is a Covenant relationship based on Jesus performance and not on our own. Did you know that God is not going to heal you or make you fruitful? Do you know why? Healing has already been established for you! It was signed and sealed by the blood of Jesus. So instead of praying, begging or waiting for God to move know that God has already moved! He has already sent forth His Word and healed, you delivered you, redeemed you, prospered you and made you FRUITFUL and whole! Psalm 103:1-3 says that God forgives ALL sin, and heals ALL diseases and 2 Pet 2:24 says “By His stripes we were healed” – Note that for New Covenant believers that this is ALL past tense! Remember always the simple truth that: Infertility, miscarriage, pregnancy health issues, baby health issues, childbirth or postnatal complications and whatever causes this are simply different forms of sickness or disease manifesting in reproductive health! But know that Jesus paid the price for all forms of sickness and disease no matter what shape or form they manifest in: headache, toothache, infertility, miscarriage, arthritis, stomach ulcers, back conditions or cancer! It’s all the same to God! We grade sickness into a hierarchy and exalt certain conditions above others. But we need to stop analysing sickness through a natural or medical mindset and instead bring it ALL subject to the truth of the cross and see it how God sees it – It is disarmed, defeated and FINISHED through Jesus finished work! Therefore, I encourage you to renew your mind with the truth that God has ALREADY done everything He could possibly do! IT IS FINISHED! 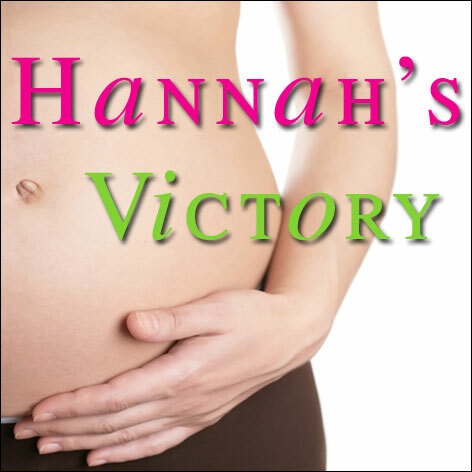 Sickness, disease, infertility and miscarriage are FINISHED! God has finished His part, it is now up to you to get to KNOW, BELIEVE and ACT on this truth so you can see His power released to transform every area of your life. Relationship – Spend time in fellowship with God – be still in His presence and let Him guide and lead you into your victory. Put it into Practice by acting on what you believe you have received through Jesus finished work! Phil 4:9 (NIV) says “Whatever you have learned or received or heard from me, or seen in me—put it into practice. And the God of peace will be with you”. And my prayer for you is that the rest will be History! FAQ – Is it God’s will for me to have a Baby? FAQ: Is it God’s will for me to have a Baby? FAQ – Is it God’s will for me to have a Baby? | Hannah’s Victory. How to rest in Jesus finished work during Pregnancy Complications! I felt led to share with those of you who face complications in your pregnancy not to be thrown “if” a challenge presents itself. Sometimes we can feel overwhelmed by the complications we face and we get caught up in analyzing why they are there or how come we are struggling etc. But at the end of the day, try not to focus on the natural facts and on the why’s or how’s, instead focus on the solution, which is Jesus and His finished work! During my 1st pregnancy it seemed like a constant battle for Kaitlin’s life! We’d overcome one hurdle and another would present itself BUT as we stopped looking to the challenges and instead looked to Jesus and focussed on the answer, we were able to get the victory every single time. Remember always that Jesus has ALREADY won the battle for you! The price has been paid and the victory already won over any form of sickness or disease – and this includes all the complications that can manifest itself in your pregnancy! The Bible says many are the afflictions of the righteous BUT the Lord shall deliver us from them all. Therefore,the Good News for those of us in the New Covenant is that we already have victory over any complication we may face in a pregnancy because Jesus has already gone before us and won the battle through His finished work. PRAYER: “Lord I can’t do this, I can’t make this happen so I resign from all of my trying and self-effort and I ask you to help me because all things are possible with you”. FAQ – Can our Past Hinder our Breakthrough? Question: Can our Past Hinder our Breakthrough? One area that I haven’t yet specifically covered is to do with our past. Remember, we are…. FAQ – How do I stop ‘doing’ and start ‘being’? Question: You mentioned in a recent post that we need to stop ‘doing healing’ by working towards healing, instead we need to meditate on Jesus finished work until we ARE healed, which means that where we are walking in and experiencing healing. Do I just envision my breakthrough by meditating on His Word? Answer: When you meditate on God’s Word and it comes to life and transforms your thinking you start seeing yourself healed. And when you walk in this new truth you then start experiencing the manifestation of what it says. Now, when I say ‘meditate’ I am referring to biblical meditation, and not that which is associated with Eastern philosophy or religions. In Hebrew the word meditate literally means to immerse your whole self in the truth of what God’s Word says by picturing, pondering, imagining, studying, and musing it over within your inner man, while also muttering, uttering and speaking this truth to yourself with the words of your mouth. Joshua was instructed not to let God’s Word depart from his mouth, but to meditate on it day and night so that he could observe himself doing all that it said. This was the key to how he would make his way prosperous and have good success (Josh 1:8 NKJV). Meditating on the Word therefore is not meant to be a one-off occurrence but rather it needs to be continued until revelation comes, and you see your circumstances through the eyes of what it says and not through what you see and experience in the natural realm. My child, pay attention to what I say. Listen carefully to my words. Don’t lose sight of them. Let them penetrate deep into your heart, for they bring life to those who find them, and healing to their whole body. Guard your heart above all else, for it determines the course of your life. If we want to have Jesus abundant life and power (the ‘springs of life’) flowing out of our heart, affecting our body, our mind and also our outward circumstances, then we need to keep God’s Word before our eyes and ears by reading it, meditating upon it, hearing it preached, and hearing our own voice speaking it. I have already shared in previous messages how God’s Word is alive and full of power (Heb 4:12). And how His Word comes to life is when it becomes living and active in us. Just think about it – when you keep meditating on God’s truth and it becomes alive and full of power in your spirit, it has to bring healing and health to your flesh! The word health or healing in Proverbs 4:21 means cure or remedy. God’s Word is the cure or remedy, or in other words, the medicine we can take to receive healing in both our physical bodies and our outward circumstances! If you went to a medical doctor and he prescribed medication for you to take three times a day, would you take it? Of course you would. You would take it in faith expecting it to cure you. And since God’s power is greater than any worldly medicine, it will not only cure the symptoms, but can also bring healing to what was causing the condition in the first place. Copyright God’s Plan for Pregnancy 2007 and It is Finished book 2010 both by Nerida Walker. All rights reserved. FAQ – I prayed, fasted and believed but I still did not receive my breakthrough. Does this mean that I don’t have enough Faith? Question: I prayed, fasted and believed but I did not receive (or have still not received) my breakthrough. Does this mean that I don’t have enough Faith? Answer: I used to feel this way too! That was until the Lord showed me that this thinking is not the right focus because our breakthrough is not based on our own ability or performance but on Jesus’ ability and on His performance! Many have the wrong idea of what faith is. Their whole concept of faith is based upon their own actions so they get caught up in works and self-effort trying to please God or to get Him to respond to their need. But Faith is simple! Faith is trusting that Jesus’ sacrifice was enough – knowing that our works or self-effort will not earn righteousness, favour or anything else from God. Faith comes and grows from hearing about who Jesus is and resting in what He has done! Our faith in Jesus is enough because when we believed in Him we received everything we needed to live a victorious and blessed life – one that’s worth living! And you know what else? We don’t need to keep hearing the Word to get more faith. Instead, we need to keep hearing so we can discover what we already have! Faith is not based on Works but on Rest! It is easy to get caught up in works and self-effort and doing everything we know to get our breakthrough. We have prayer vigils, we fast, we declare the word, and do everything in our own strength to make things happen. However, we can only keep this going for so long, so we end up worn out, burnt out, confused, and discouraged. If our breakthrough is dependent on ‘our faith’ (on our ability to believe) or on our performance by praying or doing the right things to make something happen, then we need to constantly maintain it. But think about this: if we had to do a whole bunch of stuff to receive then the end result would not be based on a free gift but on our ability to perform. Salvation comes ONLY as a free gift and is received by believing in Jesus! Seeing the fullness of what we have inherited upon salvation outworking in our lives comes the same way. Praise God for Jesus! He has already paid the price, by redeeming you and giving you everything you need for your victory. Instead of striving to receive, rest and believe in what you’ve already received! The only striving the Christian needs to do is to labour to remain in a position of resting in Jesus (Heb 4:4). This comes when what God’s Word says regarding your situation becomes ‘living and active’ – alive and real to you personally. You have spent the time meditating on God’s truth until your thinking has been transformed so regardless of circumstances you are seeing yourself with the breakthrough rather than without it. However, if you are struggling in trying to obtain your breakthrough or if you are in a place of striving, feeling desperate, hopeless or discouraged then you are not at rest. It’s time to stop ‘doing’ and start ‘being’. In other words, stop ‘doing healing’ by working towards healing, instead meditate on Jesus finished work until you ARE healed! That way your focus and actions are no longer ‘working towards’ healing (or your breakthrough) but rather ‘walking in’ healing – where you are experiencing the breakthrough you need! God does NOT use barrenness against us! God does NOT use barrenness against us. But unfortunately many believe that He does. So when couples cannot have children God usually gets the blame. But God does NOT withhold from His children! This would go against his very nature and character. There is so much I could say on this matter but I have already covered this in detail in God’s Plan for Pregnancy and on my web sites so please visit them for more information. If we believe God is using or worse causing Barrenness, then how can we go to Him or trust Him? Therefore, it is time to unlearn the traditions and doctrines of men and discover the truth that God is ALL for you being fruitful! 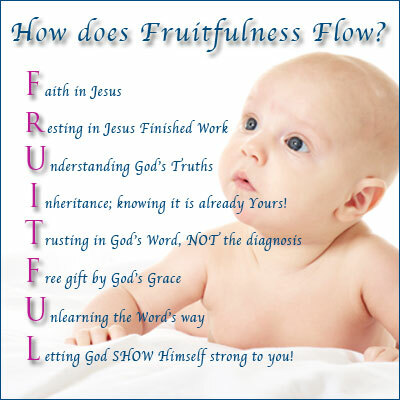 Fruitfulness is His design and purpose for mankind. How much more so for His Covenent children?! What I want you to always remember is to focus on Jesus because He is the Answer for Barrenness! So rather than looking for someone to blame or looking for the cause or the root of the condition, look to the Solution, and by this I mean continue to look to Jesus and His finished work! Jesus was the last Adam who came and redeemed mankind from everything that the first Adam bought upon us (Rom 5). He paid the price for everything that came in during the fall and that includes every form and manifestation of sickness and disease! Did you know that Infertility and miscarriage and whatever causes these are just different forms of sickness and disease operating in your reproductive organs? So the Good News for you is that through Jesus finished work on the Cross you now have victory over barrenness! Children are a blessing from God! They are not meant to be something that we fear or dread. God’s plans are NOT to harm you but to give you a HOPE and a future. God is also GOOD and He will not withhold any good thing from you. In fact God CANNOT withhold what He has ALREADY freely given! As I have already mentioned, through Jesus finished work we ALREADY have the provision of healing from ALL forms of sickness and disease. So renew your mind with the TRUTH that God CANNOT withhold children or curse with barrenness or use any form of sickness and disease against you! Remember also that in Jesus ALL of God’s promises have been FULFILLED, so children and fruitfulness are YES and AMEN (so be it) for those who believe in Jesus!